Every year in early February (well for the last few years anyway) a swarm of Triumphs descend upon the little village of Stoneleigh in Warwickshire, for the largest Triumph only show in the UK, maybe in the world? A week later there's a throng of MG's that head to the same place for the annual jamboree and scrum at the autojumble. The MGs go second because is because a week is not long enough to clear all those broken down MGB's out of the way. Errr that maybe pot calling the kettle there. I have been for the last 4 years, the middle odd years on my own and the even ones with the co-pilot. For the last two years I've had to travel in the Ford Probe, last year because TRisha was otherwise engaged (yes she was in the garage), this year because I'd not had chance to clean her... well it was raining when I collected her from Moordale and thanks to MyTravel we got back from holiday 36hours late! Before entering the show hall we talk a walk around the Triumph only parking area (this is undercover and provided welcome respite from the bitter wind). Triumphs of all shapes and sizes were lined up, the straight 6's taking advantage of the acoustics of the place to rev there engines... it's always the same with these GT6 and TR6 owners isn't it? Surprisingly there was no retort from a TR7v8; though Steve Heath (who's car was the 'cover' car to this website for Jan & Feb 04) had left his bonnet up - posser!! I have to say I think this was the largest collection of TR7's I have seen at the show, and I reckon there were probably more FHCs in attendance than at the TR Drivers weekends. The outstanding car for me was undoubtedlythe Victory Edition. Not only because it was in such good condition but also because it's the first time I've seen one in the flesh. To my knowledge this edition was specific to the USA (or Federal) market, launched in 1976 it has very distinctive stripes - which are available today. The car here though was a RHD model, it's vintage (1977/8) would probably place it at about the time these were around but whether it's a genuine Victory Edition I can not say. If you know, or indeed own, the car please let me know! The show itself seemed to lack the anorak feel that it has had of previous years, and I'm glad to say seemed to have less pushchairs than last year!! Why people have to take children of that age I do not know, it's not an ideal environment for them to be in and they do cause obstruction and annoyance when trying to view some stalls. The last thing you need went desperately searching for the all illusive spiggot washer is to have your shins carved open by a wayward perambulator! This year the show could be enjoyed more... I hadn't really got anything to buy so the Co-Pilot and I could just mosey around without the need to battle through the hoardes looking for the aforementioned washer. It was good to meet up with a few people who I knew through the forum, including those on the Club Triumph forum. 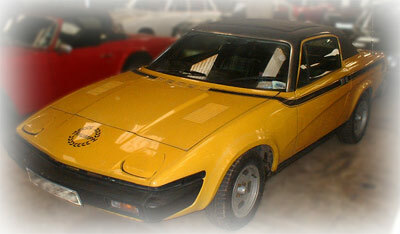 And now I know the GT6 face behind some of the "Isn't the TR7 just Marina Coupe?" jibes. Indeed Mr.Bancroft! The Club Triumph stand was well manned and laid out, seemed to lack a wedgy flavour though! The TR Drivers Club stand featured 2 of the 3 vehicles from the NEC with Guy Brinton's Grinnall replacing Kevin Morton's 'barn find'. 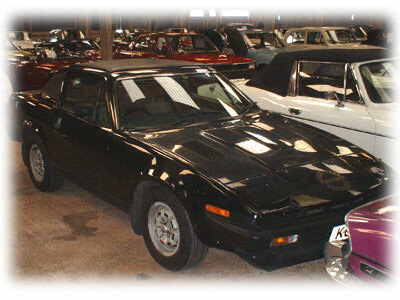 There were a further two TR7's within the indoor sale area, both DHCs - the last two shows (NEC and here) have featured a total of 9 Triumph TR7's in the various halls, and not one of them has been a fixed-head. Something that needs to be sorted for next year! We left carrying the wares we'd purchased which constituted a lot of polishing materials and some new mats for TRisha. Oh and I finally managed to get a new switch panel which hadn't had the 'fog' blanking plate removed. If you have never been it is well worth a visit, even if it's just to natter to fellow drivers and enthusiasts. Maybe next year we can think about a convoy run to or from the show?